The Costa family of Genoa, Italy, has been in shipping since the 1800s. They introduced their first passenger ship in 1948, and today the Costa fleet is Europe’s most popular cruise line. The Italian style of cruising – which includes an upbeat, international ambiance, authentic Italian and continental cuisine, and contemporary decor on its new ships – also appeals to North Americans (who comprise 10 to 25% of the passengers on Med sailings). 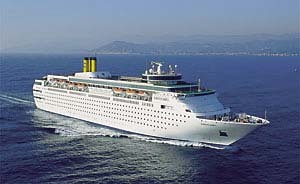 The Costa fleet services the Med in summer and the Caribbean in winter.